My friends laugh at me when I describe Edinburgh as enchanting. I suspect it's because they think I'm being dramatic by using such an old-fashioned word. But I stand firmly by my description: if anything or anywhere deserves to be described as enchanting, it’s Edinburgh. Edinburgh is one of my favourite cities; it's steeped in history, full of life, has great food and whisky and the Scots are utterly delightful. With all its closes and wynds I feel like I could spend weeks exploring it without seeing everything, and yet, it’s a city that always makes me feel instantly at home. And then, of course, there’s Edinburgh castle; always visible, sitting proudly atop its hill, making me feel like I'm in a time where its perfectly acceptable to use the word enchanting. As the name gives away The Royal Mile is indeed a (‘Scots’) mile long and connects the city’s two royal residences. At one end you’ll find Holyrood Palace and at the other, Edinburgh Castle. In-between are more shops selling tartan, fudge, souvenirs and whisky than you could ever imagine as well as cafes, pubs, bars and restaurants. This should be your starting point when you first arrive in Edinburgh, but you don’t really need a plan or anybody to tell you what to do. Just wander along and take in the atmosphere, making sure you explore the side streets, closes and wynds as well. Tip: Apart from The Royal Mile, make sure you check out Cockburn (pronounced Co-burn), Victoria and Broughton Streets. I love, love, love Edinburgh Castle and think it's a must see for any visitor to the city. Not everybody agrees though. I’ve read some tripadvisor reviews that say it’s basically just a big boring museum. And to some extent I get it; it is kind of a museum, but if you’re interested in history it’s definitely not boring. I think the key to really enjoying Edinburgh Castle is making sure you explore it with an audio guide. Without one I would’ve been wandering around without understanding the historical significance of where I was. For example, without the audio guide it’d be easy to be unimpressed with the little room where Mary, Queen of Scots gave birth to James VI, because you’d have no idea of the room's history. The audio guide brings it to life, and hey maybe I’m a bit of a history geek, but I think it’s awesome to be able to stand in a room where Scotland’s most famous queen gave birth. Even though it’s another 4 pounds on top of your already expensive entry – the audio guide is definitely worth it – it’ll help history come alive! I know they’re touristy but a good walking tour can give you solid bearings and a much deeper understanding of a city quickly. Edinburgh’s free walking tour is no exception. You’ll learn heaps about Scottish history, including stories about the inspiration behind Jekyll and Hyde, the city’s once insatiable obsession with anatomy that led to a body snatching epidemic and ‘half-hangit Maggie’ who survived being hanged. This is a historic little market place on a lower level than much of the rest of the city, meaning you get a great view of the castle towering above you. If you want a good photo of the castle…this is the place to get it. Tip: The bars around here are a bit touristy and tacky but swing by Mary’s Milk Bar for a milkshake…delish. Edinburgh is a hilly place but its most famous peak is Arthur's Seat. I was intrigued by its name (who is Arthur?!) but despite theories, nobody really knows for sure where the name came from. Regardless, it’s worth spending an hour or two walking up to the top for beautiful panoramic views of the city. If you’re lazy, as I have been on occasion when visiting, you don’t even need to get to the top for a great view. With nicknames like Auld Reekie, it’s no wonder Edinburgh tried to rebrand itself as ‘Athens of the North’. Although it never really took off, the nickname came about for a variety of reasons including the two cities’ geographical similarities and the comparisons of the Scottish Enlightenment to Greece’s philosophers. The Scots even went as far to build what they hoped would be a second Parthenon at the top of Calton Hill. Construction of the National Monument of Scotland began in 1826 but just three years later was left unfinished due to lack of funds. Although it has been called 'Scotland's Disgrace', to me there’s a certain charm to this half finished Romanesque statue on top of Calton Hill. If you’re not all exercised out from Arthur’s Seat it’s worth walking up the hill to check out this monument, as well as the creepy old burial ground and remnants of a prison. Tip: Calton Hill is best enjoyed at night. You’ll also get great views of the city and castle lit up in the evening skyline. Without any authority to say this, I’d say this is the most famous cemetery in Scotland. There are just so many interesting stories about and involving it. 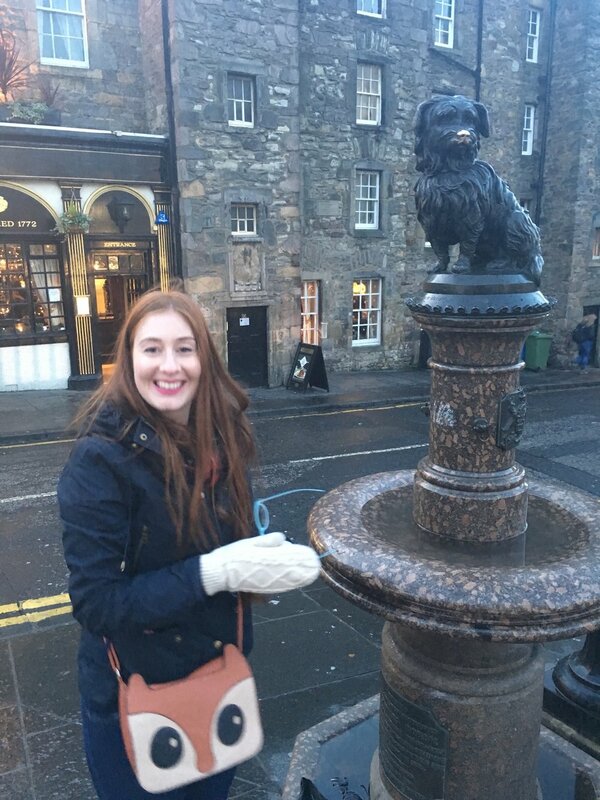 There’s Greyfriars Bobby (see below), Thomas Riddell's grave (for Harry Potter fans) and tales of body snatching. They even say this graveyard is so full of bones some come to the surface when it rains. 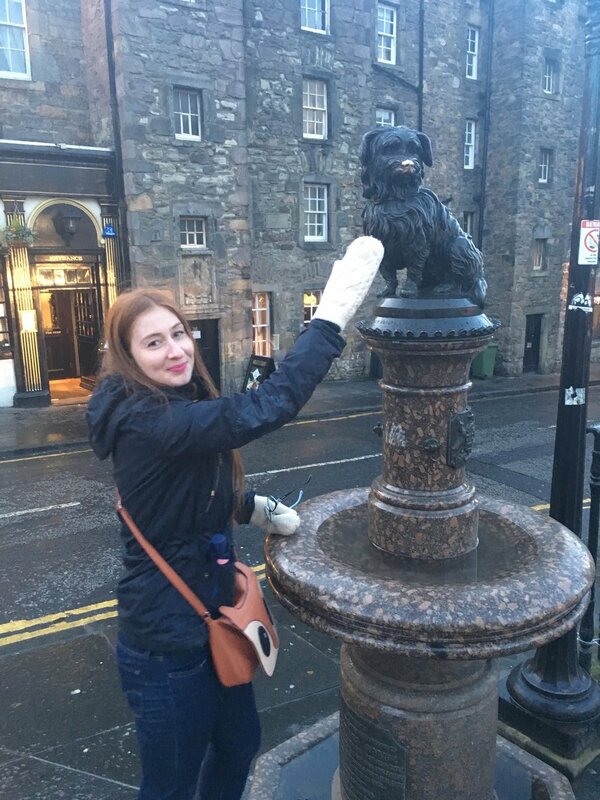 And then of course, there’s Greyfriars Bobby. The story is as adorable as it is sad. It’s said that Bobby, a little Skye Terrior, was so heartbroken by the death of his owner John Gray that he spent the rest of his life sitting by his master’s grave in Greyfriars Kirkyard. When Bobby died 14 years later, he was also buried in the graveyard. Visitors today leave sticks and balls at Bobby’s grave to commemorate the little dog’s loyalty. That, my friends, is what true love looks like. Tip: For enthusiasts like me, there’s even a memorial to Bobby opposite the entrance to the churchyard. But don’t rub his nose; the locals don’t appreciate the upkeep involved in having to repaint his nose black. Holyrood Palace has a rich history and is still the official residence of Her Majesty The Queen in Scotland today. If it’s raining this is definitely worth a look but if it’s your first time to Edinburgh I wouldn’t say it’s a must see. This is a great museum, but not a must see if you're pushed for time. If you do swing by, make sure you check out Dolly the (cloned) Sheep. With a surname like Robertson I might be biased, but the Scottish Highlands have to be one of the prettiest places on earth. First there’s the vast, epic, stark beauty that you’ll never forget. Then there are the stories of the highlander clans that are heart-breaking, endearing and inspiring. There’s stunning coastline, castles, friendly locals, whisky, and of course Loch Ness. There’s not much else I want to say because you don’t even need to know much, you just need to go. Go on a day tour (I recommend Rabbie’s) and let the locals passionately share their history; you’ll forever feel connected to the plight and the strength of this beautiful land and its people. Tip: If your tour passes through Callander, ease your way into the local way of eating with a steak and haggis pie from the Mhor Tearoom. The Devil’s Advocate is one of my favourite restaurant/bars in Edinburgh. Hidden away just off the Royal Mile in an old Victorian pumphouse with over 200 whiskies…how could it be bad? The food is good, the whisky plentiful and the atmosphere is delightfully cosy. If haggis is Scotland’s national dish, whisky is its national drink. I love this simple little bar for their great service and extensive range of whisky. Don’t go to Edinburgh without ducking into Brewdog for a pint of Scotland’s finest. If it's raining, score a booth and play one of the many board games they have lying around. A friend recommended Oink to us: it didn’t disappoint. In a number of locations and best for takeaway, you can get simple but delicious hog roast roll with your choice of sauce. If you’re a fan of roast pork, you’ll love this. You can’t get anymore Scottish than haggis. When you first learn what it’s made of the only acceptable response is ‘eww’. But, and I’m not sure if I should admit this, it’s really tasty. It has a really unique, nutty savoury flavour. It’s all about the spices so if you're veggie you'll find vegetarian haggis tastes pretty similar. I think anybody that visits Scotland should give it a go. Irn-Bru is Scotland’s other national drink – apparently it’s the only place in the world where a local soft drink outsells big brands Coca-Cola and Pepsi. It’s fluoro orange and I think it tastes kind of like creamy soda. It’s yum and in my experience pretty good for hangovers. A must for anybody who wants to immerse themselves in Scottish life. Scottish tablet generally has three ingredients – butter, sugar and condensed milk. It’s basically crumbly delicious fudge. Enough said. To me, Edinburgh sits alongside London as one of the UK's greatest cities. While much smaller in stature and size than it's capital cousin down south, its old world charm leaves a lasting impression that's hard to forget. Outlander - if you're a reader the books are better but TV series isn't too bad.